Heated Leather Seats, Moonroof, Nav System, Keyless Start, EX PREMIUM PACKAGE, EX TECHNOLOGY PACKAGE, Aluminum Wheels, Onboard Communications System. EPA 29 MPG Hwy/22 MPG City! EX trim, RED exterior and BLACK interior CLICK NOW! 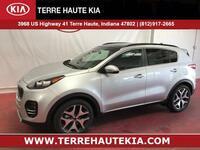 Leather Seats, Back-Up Camera, Onboard Communications System, Aluminum Wheels, Keyless Start Kia EX with RED exterior and BLACK interior features a 4 Cylinder Engine with 181 HP at 6000 RPM*. EX TECHNOLOGY PACKAGE Compact Spare Tire, Smart Power Tailgate, Front & Rear Park Assist System, Automated Emergency Braking, pedestrian detection, High Beam Assist, Lane Departure Warning System, Ventilated Front Seats, Radio: AM/FM/MP3/SiriusXM, 8 touch-screen, onboard navigation, Android Auto, Apple CarPlay, UVO eServices telematics, harman/kardon 320-watt sound system, 8 speakers and Clari-Fi, Bluetooth phone and streaming audio and USB/auxiliary input jacks, 8-Way Power Adjustable Passenger Seat, EX PREMIUM PACKAGE Auto-Dimming Rear View Mirror w/HomeLink, Panoramic Sunroof, power sunshade, LED Interior Lighting, Heated Steering Wheel.